Strawberries are so sweet and perfect on their own, I hate to mess with them. Unless there’s an ice cream maker handy, in which case I don’t hesitate to pulverize them beyond recognition for a greater cause: strawberry ice cream. If you’ve never made homemade ice cream, you’re missing out on one of summer’s greatest indulgences. An electric ice cream maker makes the job a pleasure and once you’re hooked, there’s no end to discovering what goes well with chilled cream. 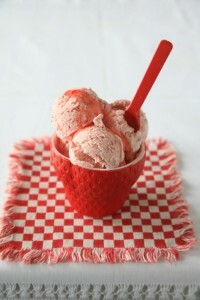 Strawberry ice cream is just the beginning. Plan ahead: It takes about 24 hours to freeze an ice cream canister. The custard also takes time to chill in the refrigerator before it is turned in the pre-frozen canister. You’ll also need a fine-mesh strainer placed over a bowl or pitcher. Pour the milk and cream into a medium-sized saucepan until the mixture just begins to boil. Remove from heat. In a medium bowl, whisk the egg yolks with the sugar. Add about half of the warm milk and cream mixture to the egg yolks and whisk until well combined. Slowly pour the yolk mixture into the saucepan with the remaining milk and cream mixture and bring to a bare simmer, whisking continuously, being careful not to bring to a boil. The custard will slowly thicken — be patient, it takes time. The custard is ready when the mixture thickens enough to lightly coat the back of a spoon. Pour the mixture through a strainer into a bowl or pitcher. To cool the mixture quickly, place the bowl or pitcher into a larger bowl filled with ice. Cover the custard with plastic wrap and place in the fridge until well chilled. Combine the chilled strawberry puree and the custard and pour into a frozen canister. Freeze according to manufacturer’s instructions. For special occasions, I’ll serve these refreshing sorbets in their lemony containers. More often though, I’ll make a jugful of sorbet and serve it in clunky glasses with big straws. Depending on the crowd, I’ll add a splash of vodka. Sorbets are made in an ice cream maker but if you don’t have one, you can always make a granita instead by freezing the mixture in a shallow container and stirring it now and then with a fork. Sorbets are smooth, granitas are granular; both offer sweet frosty relief on a warm summer’s day. I’ve used small sherry glasses to hold the lemons in place; wide shot glasses also work. If you do not have suitably sized containers, you can cut a small slice from the bottom of each lemon so that it sits upright on a small plate without tipping over. The lemons will be used as containers, so it is important not to manhandle them while you’re extracting their juice. If you have a lemon reamer on hand, use it. Once the juice has been squeezed, strain and refrigerate it until well chilled. Carefully scrape and discard all the pulp from the lemon rind “containers” and clean them with a damp cloth. Set aside in the refrigerator until ready to fill. In a small, heavy saucepan, combine the water and sugar. Bring the mixture to a gentle boil and cook for a minute or two until the sugar dissolves and the syrup is clear. Set aside to cool at room temperature then cover and refrigerate until well chilled. Add the lemon juice to the syrup and stir to combine. Pour into an ice-cream maker and freeze according to the manufacturer’s instructions. Transfer the sorbet to a freezer-safe container. 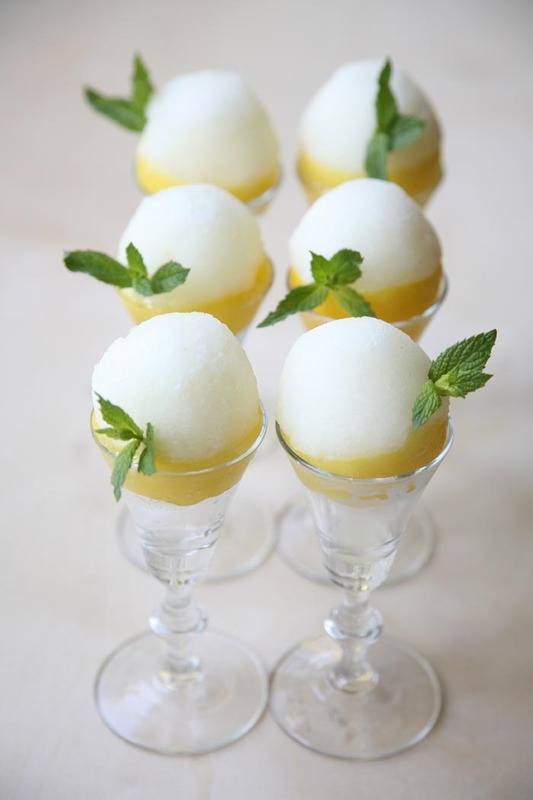 Gently pack the sorbet into the lemon “cups” with an ice cream scoop or a rounded spoon. The sorbet melts quickly; once you’ve finished one, cover it with plastic and place it in the freezer before starting the next one. The sorbet should be taken from the freezer a few minutes before serving. Remove the plastic wrap and garnish with fresh mint. 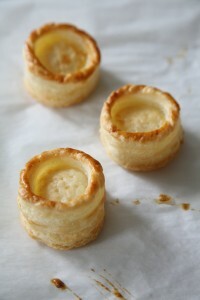 Vol-au-vents are light, delicate, pastries that typically hold creamy, savoury ingredients. You’ve probably seen them in the freezer section of your local grocer but if you want an extraordinary appetizer, you’ll need to handcraft your own puff pastry. I once made dozens of vol-au-vents for a friend’s party. The pastry shells were filled with creamed lobster and served on small napkins as finger food. Unfortunately, much of the filling ended up dribbling down the front of the guests as they attempted, unsuccessfully, to eat the appetizer in a single neat bite. Serve vol-au-vents on small plates with a fork and large napkin. To prevent dough from sticking, roll it onto a flour-dusted sheet of parchment. Roll half the dough and shape into a rectangle approximately 16” x 12” and about 1/4” thick. Cover with plastic and refrigerate while you roll out the remaining dough. Roll the balance of the dough into another rectangle approximately 16” x 12” and about 1/4” thick. Stamp the pastry into 12 more circles, 2 1/2” diameter, then using a 2” cookie cutter, stamp a hole in the centre of each circle; the outer ring will form the vol-au-vents’ rim. Remove the pastry from the fridge and brush the edges with the beaten egg. Place the pastry rings along the egg-moistened edges. Holding a vol-au-vent in front of you, score the outer edges by etching vertical lines every quarter inch, with the dull side of a knife. This helps the dough to rise evenly. Refrigerate or freeze until ready to bake. Place the tarts onto a parchment-lined baking tray with an inch between each. Poke holes into the base of each tart, with a fork. Bake the chilled dough in a pre-heated oven for about 10 – 15 minutes, or until golden, on the middle rack, rotating the pan halfway during baking. Cool the tart shells on a wire rack. 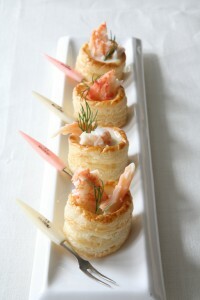 Just before serving, fill each with 1-2 Tbsp of savoury filling and garnish with crab or lobster and dill, if desired. Delicious filled with cooked crab and the lemony herb filling used in the chicken pot pie recipe. Few foods transcend all seasons — cozy sweater food is not the same as breezy sundress fare — but omelettes stride both comforting and light in a single reassuring bite. 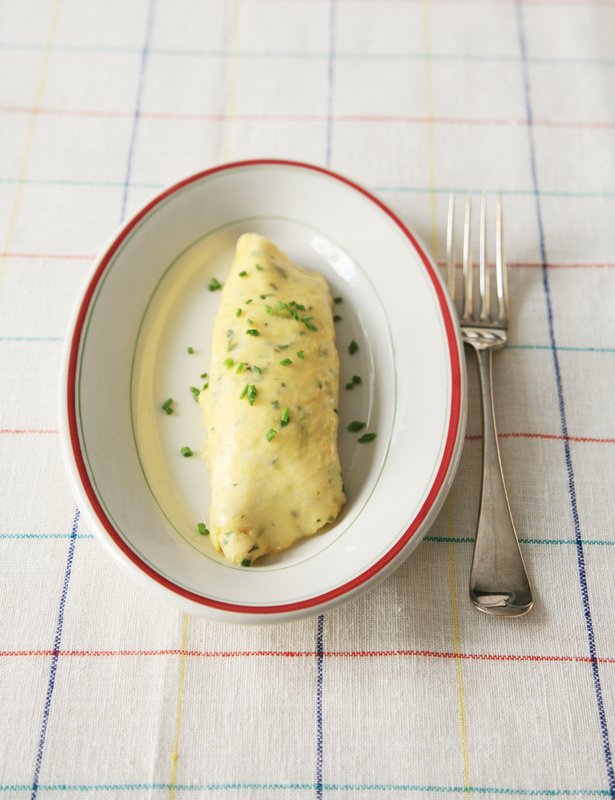 More technique than recipe, a classic French omelette is very different from your sturdy, stuffed with “the works” omelette. I enjoy both but when I’m in the mood for something delicate, I’ll opt for the lighter classic version with its soft and creamy interior. Describing how to make an omelette is like explaining how to swim; you need to jump-in to understand the process. It’s not difficult but it requires a bit of dexterity: once the eggs hit the pan, you grab the skillet handle with one hand and shake the pan to-and-fro while scrambling the eggs with the other. Sort of like patting your head and rubbing your tummy at the same time. This quirky technique prevents the eggs from forming curds. The result is a remarkably tender omelette — in under a minute. With patience, practice and a decent non-stick pan, you’ll be on your way, no matter the season. Heat a skillet over medium-high heat and add the butter and oil. While the pan is heating, whisk the eggs and herbs in a small bowl and season with a pinch of kosher salt. Pour the eggs into the hot pan and stir continuously as if scrambling eggs, while grabbing the pan’s handle with your free hand to shake the pan to and fro. When the eggs are almost set, remove the pan from the heat and smooth them with a spatula. Run the spatula around all sides of the omelette to loosen it from the pan. Tip the omelette to slide the eggs to one side of the pan then using a spatula, gently fold one-third of the omelette onto itself. 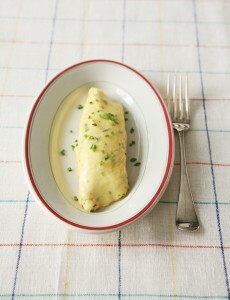 Then, holding the pan over a plate, slide and roll the omelette onto the plate so that it lands with the seam side down. 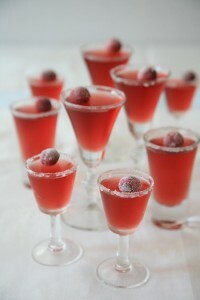 My holiday mantra this year is “keep it simple” and these sparkling jellies are simplicity in a glass. Made of cranberry juice and a splash of Grand Marnier, these grown-up jellies are both sweet and tart. I’ve dusted the rims of sherry glasses with fine sugar before pouring in the fortified juice. Once the gelatin does its magic in the refrigerator, the jelly can be topped with a boozy little cranberry marinated in liqueur and rolled in fine sugar. Wishing you a sweet and joyful holiday. Optional garnish: whole cranberries, soaked overnight in Grand Marnier and rolled in fine sugar just before serving. In a small saucepan, heat one cup of cranberry juice. When the juice is warm, add the gelatin and stir until dissolved. Pour the mixture into a large measuring cup with a spout and add the balance of the cranberry juice and the Grand Marnier. Mix until combined and cool slightly. If you wish to add sugar to the rim of your glassware, do this before you add the cranberry juice. Pour the sugar onto a small plate. Dip the rim of your glassware into a bit of water and then onto the plate with the sugar. Fill the sugar-rimmed glassware with the cooled cranberry juice mixture. Refrigerate until set. Serve chilled, with small spoons. Note: Port can be substituted for the Grand Marnier if you don’t mind an opaque, rather than clear, jelly.